My kids love making things out of dough, and salt dough is one if the easiest dough’s to make at home. It only has 3 ingredients and it takes minutes to whip together. It also hardens so the kids can safe their creations forever! Today I’m sharing 25 fun things your kids can make out of Salt Dough. If you don’t like Salt Dough and would like an alternative that is more like clay, I have this Better Than Salt Dough recipe you can try too! It’s the most popular post on my blog, so you know it’s a great one. So let’s start with the best recipe for Salt Dough. If you need about 2 cups of dough you would use 1 cup flour, 1 cup salt and 1/2 cup warm water. I wouldn’t make more than about 6 cups in a batch at a time or you might have a hard time stirring the dough and getting the flour to work in. Just mix the flour and salt together then add the water and start stirring with a sturdy wooden spoon. When the mixture get’s too hard to stir, get your hands in there and knead the dough until it’s soft and pliable. The ideal thickness for most of these crafts is about 1/2 cm. If you decide to make it thicker or thinner you would need to adjust your drying time. You can let the dough air dry for about a day, or you can bake it in the oven at 200­° F for a few hours until it’s dry all the way through. And if you want to learn how to keep your salt dough really white, try this recipe. So now let’s see all the cute ideas these creative people have come up with to make out of Salt Dough. Some are seasonal so we will work through the year with these ideas. Salt Dough Hand Print Snowmen Keepsake from Learning and Exploring Through Play. This Fingerprint Gingerbread Man Ornament from Crafty Morning is a fun one to remember how little the kids once were. No Cook Cinnamon Ornament Clay will make your house smell yummy and make your tree pretty. This Salt Dough Star Garland from Pretty Prudent is adorable. You can wrap it around the tree or your can use it to hang from the mantle over your fireplace. Here is another Cinnamon Spice Salt Dough recipe from Simply Notable but these ornaments have glitter. I can’t wait to make these ones for my tree this year. This is my recipe for Better Than Salt Dough Clay. You can use this recipe in place of any of these other recipes. We had fun making all sorts of shapes and painting them. These Fingerprint Christmas Trees from Messy Litttle Monster would be a great gift for grandparents, don’t you think? These Salt Dough Hand Print Mittens from My Buddies and I are so adorable and a great keepsake to remember those tiny little hands. I love these Family Thumbprint Ornaments from The Pinterested Parent that are personalized. What a great idea for Christmas Gifts. These Snowman Faces are the cutest! I’m excited to make these with the kids this year. I love this idea for Santa Hand Prints from Messy Little Monster. Christmas Salt Dough Ornaments from Mosswood Connection. Candy Cane Salt Dough Ornaments from Simple Fun for Kids. Thumb Print Stars from Crafts on Sea. Gender Reveal Salt Dough Volcano from Preschool Powol Packets. These Salt Dough Heart Magnets from Red Ted Art are so adorable. How cute would your fridge be with these all over it. You can use a stamp or thumbprints. This Handprint Bowl from Messy Little Monster is the cutest idea for a gift this Valentines Day. I am in love with this Heart Cookie Salt Dough Garland from Tag & Tibby. These Salt Dough Heart Candle Holders are a great gift idea for Valentines Day. How cute are these Salt Dough Heart Magnets as Conversation Hearts from The Connection We Share? These cute Salt Dough Valentine’s Chocolates from School Time Snippets are fun for play time. These “Thumbody Loves You” Valentines from Messy Little Monster are a great alternative to candy! Salt Dough Easter Eggs from Design Mom are a great replacement activity for dying eggs if your kids have allergies. Salt Dough Fingerprint Flowers from Meaningful Mama are a beautiful keepsake. I love these beautiful magnets for Spring from Gathering Beauty. This is a great activity for the kids. Leaf print salt dough from Artful Parent. These Easter Salt Dough Ornaments from Tidy Mom are another fun Easter Activity for the kids. How adorable are these Easter Handprint Keepsake Ornaments from Teach Me Mommy? Another great idea on how to display Easter Egg Ornaments. This cute garland from Desparate Craftwives would be adorable over the mantle. I love Earth Day Salt Dough activities for the kids and these Earth Day Necklaces from Natural Beach Living are the cutest. These “Love My Planet” handprint photo keepsakes from Teach Me Mommy are a fun activity for Earth Day too. I love these beautiful nature prints made into a mobile for spring from The Magic Onions. Another cute keepsake from Learning And Exploring Through Play. 3D Salt Dough maps from Kid World Citizen. Earth Playdough from Playdough to Plato teaches the layers of the earth. Handprint Lorax Hand Print from JinxyKids.com. Such a fun activity for earth day too! Ice Cream Cone Necklaces from Let’s Do Something Crafty. This is a perfect Summer craft. Fingerprint Ladybug Magnets from Messy Little Monster are the perfect addition to your fridge. My kids love to collect shells when we visit the beach and these Salt Dough Fossils from The Imagination Tree would a great activity for the kids to do with all those shells they bring home. My kids would have a lot of fun making these snakes from Frugal Fun 4 Boys and Girls and scaring people out in the yard with them. These adorable Suncatchers from Reality Daydream are fun to highlight the great summer light. Another great idea to save all those treasures the kids bring home from the beach. Salt Dough Shell Mosaics from Jennifer’s Little World. Here is another version of the sea shell mosaic from Local Fun for Kids but it’s made with wheat flour so it looks more like sand. And, one more variety of something you can make out of shells from Red Ted Art. The Rainbow Fish Ornament from Artsy Momma is a great one for summer too! Salt Dough Dinosaur Fossils by Messy Little Monster. If you didn’t find any star fish on your vacation, why not make your own? These ones are made out of Salt Dough from The Crafting Chicks. Ramadan Gift Tag tutorial from A Crafty Arab. Salt Dough Baseballs from Creative Family Fun. Pumpkin Spice Salt Dough is a great recipe for the fall season. Get the recipe here from Fun at Home With Kids. These fall Salt Dough Ornaments from Meaningful Mama are so cute. I love this Halloween Tree and you can make the ornaments out of salt dough from My Kid Craft. Jack Skellington Ornament from This Girls Life. Easy and so smart! 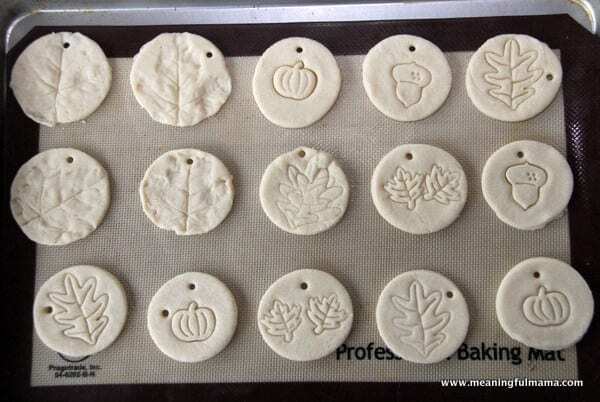 Cinnamon Salt Dough Leaves from The Imagination Tree are perfect for a Thanksgiving Tree. Here is another recipe for Autumn salt dough from Playdough to Plato you can use for the kids to play with. I think this Halloween Garland is perfect with the glitter from KC Edventures. These leaf Salt Dough Bowls from Meaningful Mama would be fun holding some food on the table for Thanksgiving. There you have it. Some of the best Kids Activities out of Salt Dough. Now get busy and get creative with your kids today making Salt Dough.